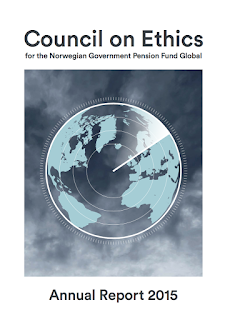 Eli Lund, Executive Head of Secretariat for the Council on Ethics for the Norwegian Government Pension Fund-Global, Norway's flagship sovereign wealth fund, has been kind enough to circulate the Council on Ethics Annual Report 2015. The Annual Report includes brief articles on specific topics relevant to the Council’s work, such as the assessment of companies producing nuclear weapons, corruption risk, environmental damage or violation of worker’s rights. The report also includes a summary of all the Council’s recommendations to Norges Bank that have been published in 2015 and until 1 February 2016. The Council on Ethics welcomes any feedback you may wish to give. Mine will appear in a future post.